The Los Angeles Regional Food Bank Honors Many Years Of Service To The Community By Elena Guzman of Catholic Charities. For more than three decades, Elena Guzman has served our community with grace and compassion at Catholic Charities’ San Juan Diego Center in El Monte as Site Supervisor. Catholic Charities, the Food Bank’s second-oldest partner agency, provides food pantry distributions, parenting classes, CalFresh outreach, healthy eating classes, financial assistance and more. Elena oversaw all of these programs and mentored her granddaughter, Martha, who is now a major part of these programs’ continued success. Martha recalls that Elena would welcome clients after hours to make sure they had enough food to eat, clothes to wear and would even give people gas money out of her own pocket. Elena has endless admirable qualities, including the ability to make anyone feel right at home. She always greeted clients with, “welcome, come in” as if she was greeting visitors to her home, not work place. She knew the regular clients by name, and it was common for her to chat with them about their lives. It is fitting that Elena is receiving the prestigious Tony Collier Award for her dedication and service to our shared community. Collier began the work of the Los Angeles Regional Food Bank in Pasadena in 1973 by collecting food donations in his truck and delivering them to agencies serving people in need. Because of his efforts and because of the work being carried out by individuals like Elena today, children, seniors, working families and people facing homelessness all throughout LA County have increased access to vital resources, including a sense of belonging and community. We are humbled to know and to have worked with Elena as she truly exemplifies our vision and mission. 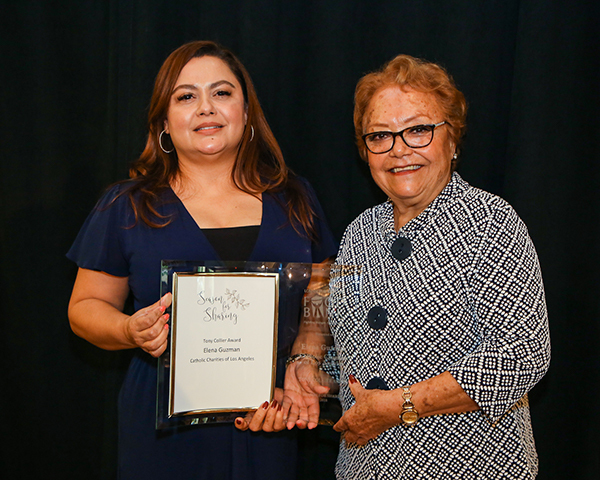 We congratulate Elena Guzman on her retirement, and we know that even though her official time at Catholic Charities has concluded that she will continue to be a major asset to the Los Angeles community and to her neighbors in need.